Cozy Tea & Spices is great place for breakfast with a rich menu offering smoothies, fresh fruit juices, and yummy morning pastries. There are all types of tea: black, green, white, oolong, herbal, and spiced tea. There are also other offerings such as salep, golden milk, milk with saffron, matcha latte, organic cacao, liquid chocolate, famous American donuts, wine, and appetiziers. Furthermore you can sit and eat brunch served with local eggs, sweet or sour terhan etc. Taverna Pazari i Vjetër is a great stop to drink the famous Albanian tea, the deliciously scented mountain’s tea. You can return for lunch to taste a traditional dish of the area, accompanied by wines or rakia. Komiteti Kafe Muzeum offers a journey back in the time of communism and also features cultural and ethnographical elements of the past three centuries. It is a singular place that serves as a bar and museum, and it is also a place for young artists to exhibit their talents. It carries more than forty kinds of rakia and other traditional beverages, it is an ideal place to discover the spirit of Albania and Korça. A great number of taverns have opened in the first line of the bazaar offering traditional lunch dishes. 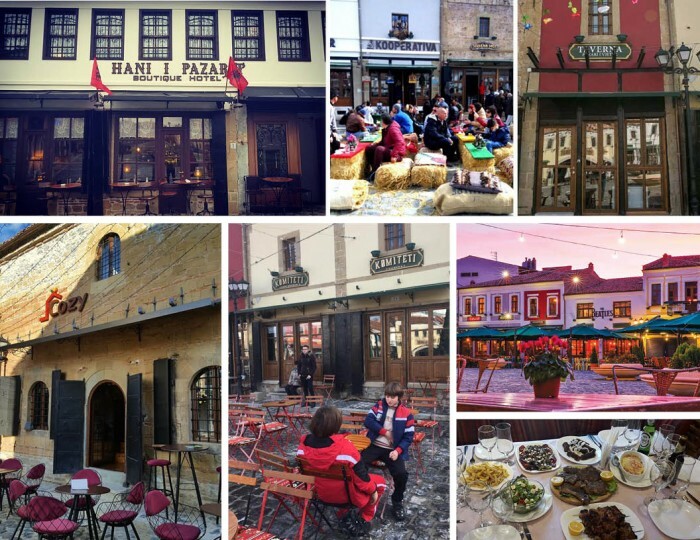 Two great back to back places are Taverna Pazari i Vjetër and Kooperativa located in “Liria” square. The memory of a great journey will be accentuated after a great local meal prepared with healthy local products. Meanwhile, Colonial Osteria offers a little from the 1920s and 1930s styles and a great cocktail. The Beatles Bar is a great gig place for the late evening hours. The two-storied bar has stages in both floors for young and experienced musicians. Hani i Pazarit is a great place to sleep in this area, but make sure you book in advance. This hotel is highly rated and it is the first choice for tourists when visiting the city. Talking about memories, it is advisable to take away souvenirs after leaving Korça. 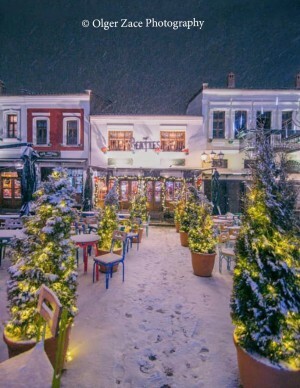 The bazaar offers a variety of choices and many shops First stop is Suvenir Shop Korça, where you can choose among decorations of wood, alabaster, copper, stone, wool, handmade embroidery, and many other handcrafted goods from the artisans of Korça. Second stop is Zajre Korçare Shop, where you can become acqauinted with Albanian products such as dried fruits and veggies, pickles, jams or other rare edibles. Have you ever heard of eggplant jam with walnuts? Another stop is Cozy Tea & Spices which offers more from around the world and if you like universal tastes and scents you can pick among perfumed plants, teas, spices, organic products, superfoods such as chia seeds, linseeds, sesame, tahini, spirulina, matcha, rosehip, reishi mushroom, and the delicious local olive oil and honey. Albanian Souvenir is next to Colonial Osteria with a wide variety of traditional souvenirs such as woolen rugs, national folk dresses, and other decorative items that represent the Albanian tradition. The old bazaar is an ever evolving location, each time you return, you will find a new enterprise, a bar, a shop or a restaurant that would be delighted to offer a piece of this century old gem. TID (Tourism Improvement Development) is a group of businesses that run the Old Bazaar. This organization is encouraged and supported by the American-Albanian Foundation to further develop the wellbeing of the market area, benefiting all the residing communities. It has an administrator that coordinates the general work, the maintenance, ensures collaboration, raises common issues, and prevents damaging consequences. TID is a new enterprise that has been successful in all the Albanian cities where it has been applied. The bazaar of Kruja had one called BID (Business Improvement Development), which functions in main boulevards and it was reconstructed by AADF. Similar examples are BID Shkodra and BID Berat.